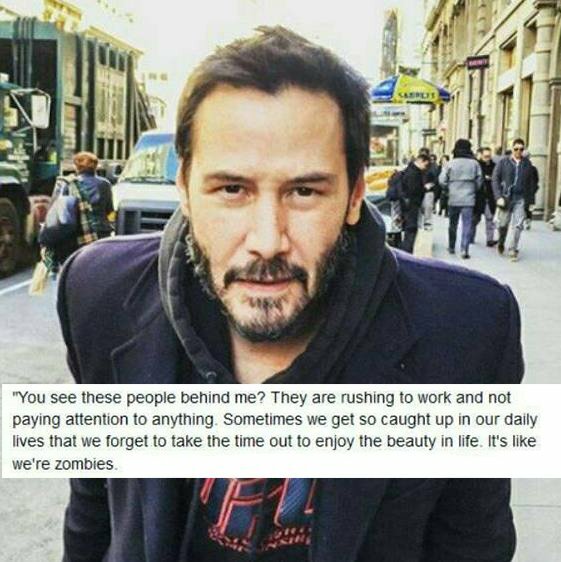 A Little Holiday Message from Keanu Reeves. Reeves has the right idea. His message is simple and human. Stop worrying about gifts and stress and work and obligations. Those things are never going to go away, but you know what will? Now. Things like the cooking smells while Mom’s making her famous curry, your son’s still-small face when he’s staring intently outside to see the northern lights, the sound of the furnace kicking in, reminding you how grateful you are to have a warm home—all of these moments are what make us content and happy. Not rushing, not buying, not stressing—in trying to make the holidays “perfect” we’re ignoring how perfect things are right this very second. If we have to deal with the usual stresses of day-to-day life anyway, and even more during the holidays, we’ll be much happier when we take the time to enjoy whatever’s in front of us right now.